If you notice your plumbing lines are draining slowly, if you have had tree roots infiltrate your sewage line, or you live in an older home, you should consider having your sewer line cleaned out to prevent clogs that can cause raw sewage to backup into your home. Call us at 1-844-884-5409 to request an appointment for sewer cleaning today! Pipe Works Services, Inc. can clear your clogged sewer line quickly to prevent costly damage and repairs. We provide free estimates and 24-hour emergency plumbing service in Livingston, Parsippany, Summit and surrounding New Jersey. Hidden sewer clogs. Many sewer problems occur in the part of your sewer line that you can't see. A camera can be used to inspect your main sewer line & locate clogs or obstructions. There are several ways your main sewage line can become clogged or obstructed. Drain pipes inside your home can clog with grease, hair, food, and other blockages. 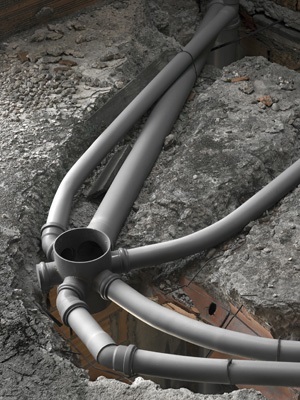 Sewer lines and pipes can shift due to expansive soils and cause your sewer line to break. Tree roots can extend into underground sewer lines and cause a blockage that you may not notice until it’s too late. No matter what's causing your sewer line to clog or keep backing up, we can provide a fast solution and peace of mind. Using a camera, we can easily look inside your sewage line to locate a clog and inspect the condition of your underground pipes without costly digging. We then use high-pressure jetting to effectively remove debris, including blockages, grease, and tree roots. If you’re sewer line is badly damaged, we can replace it without damaging your property with our trenchless plumbing solution. Here at Pipe Works Services, Inc., our goal is to provide you with a fast, affordable solution. From our video sewer inspection and wide range of plumbing services to our free estimates, we can solve all your sewer and drain cleaning needs with minimum hassle. Call us or fill out our contact form to request a free estimate today! We proudly provide our sewer cleaning services throughout Basking Ridge, Short Hills, Berkeley Heights, Florham Park, New Providence, Millington, Millburn and surrounding cities and towns in New Jersey.